Begonias are tropical plants that enjoy somewhat shady, humid environments with cool to moderate temperatures. They’re most commonly grown as indoor plants for their showy foliage. The Angel Wing begonia has long cane-like stems and large, colorful leaves that are shaped like angels’ wings. Clusters of hanging flowers bloom atop the 2-foot-tall canes. Angel Wing begonias are man-made hybrids that range in size from dwarf varieties to those that grow up to 4 feet tall. Keep your Angel Wing begonia in bright, indirect light, but not in direct sun. Maintain cool to normal indoor air temperatures around your begonia of 50 to 75 degrees Fahrenheit. Water your Angel Wing begonia when the potting soil begins to feel dry to the touch. Provide warm water until it begins to drain through the bottom of the pot. Keep your Angel Wing begonia’s potting soil evenly moist but not wet or soggy. 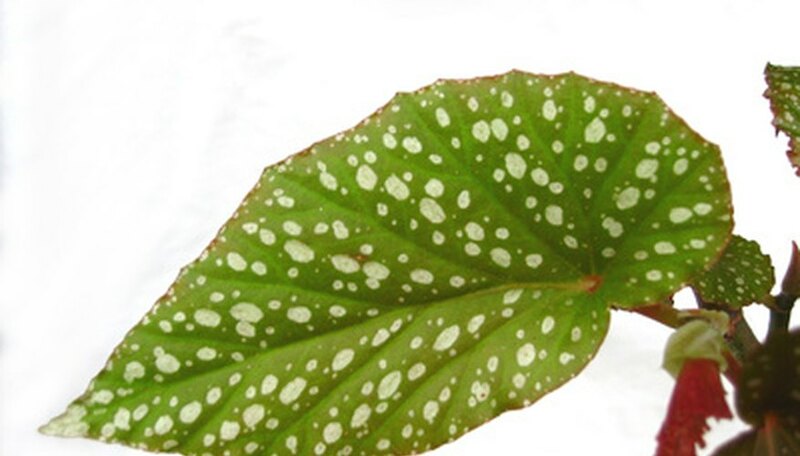 Feed your Angel Wing begonia once every two weeks with a water-soluble, lime-free and high-nitrogen houseplant fertilizer at half the normal dosage rate. Don’t fertilize the begonia while it’s flowering. Keep the air somewhat humid around your Angel Wing begonia by misting it two or three times per week with warm, lime-free water. You can also fill the drainage dish with pebbles and some water to increase humidity around the begonia, but ensure that the pot is sitting on the pebbles and not in the water. Pot your Angel Wing begonia in a container that has drainage holes in the bottom and is filled with a rich, organic potting mixture containing peat moss and/or organic compost. You can also use a commercial potting mix made for African violets. Watch out for mealybugs infesting your Angel Wing begonias. If you detect mealybugs, you can apply an appropriate insecticidal soap or horticultural oil to get rid of the infestation. Follow the directions on the label exactly. Why Are My Geraniums Not Blooming?